In his late 30s, Julien Patterson left a career with the CIA with plans to start a business. His initial efforts failed. 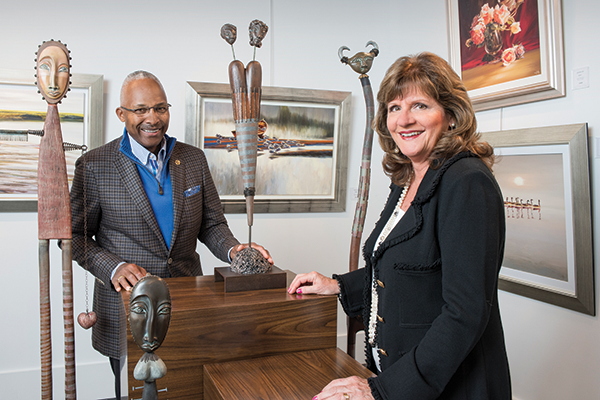 In 1990, however, a lucrative contract and a $10,000 loan from a friend helped Patterson and his wife, Terri Wesselman, launch Omniplex World Services Corp. The Chantilly-based security and investigative firm grew, eventually employing more than 3,500 people and having annual revenue of more than $100 million. Patterson and Wesselman sold the company in 2012 to California-based Altamont Capital Partners. Now retired, the couple have homes in the Northern Neck and in Florida. But some would not recognize their lifestyle as retirement. They have started four small businesses in the Northern Neck: an art gallery, a home décor store, a coffee shop and a clothing boutique. They also are involved in potential business ventures in Florida. Patterson, a former chairman of the Virginia Economic Development Partnership and the Virginia Chamber of Commerce, says their aim is to create jobs and stimulate the local economy. “For me, I think retirement is the change in venue that allows you to do the things you want to do that benefit others and brings you satisfaction and a sense of well-being,” he says. Patterson, who is 65, is on the leading edge of the baby-boom generation that is redefining retirement. Some retiring boomers will leave the workforce entirely. Others, like Patterson, will begin new careers because they find work to be fulfilling. A third group will continue working because, financially, they have no other choice. In 1900, only 13 percent of Americans were age 50 and over. By 2002, the number had more than doubled to 27 percent. By 2020, it will be 35 percent. But that’s only a ripple in the tidal wave that’s coming, as 78 million boomers — born between 1946 and 1964 — enter their retirement years. Every state is bracing for what is being called an unprecedented demographic disruption. Currently, Virginia is home to 1.4 million people who are over the age of 65, about 17 percent of an estimated population of 8.4 million. The number of Virginians in that age group is expected to climb to 2.3 million by 2030, representing nearly a quarter of the projected state population of 9.8 million. In addition to current Virginia residents who retire here, retirees from other states also may be headed this way. In national surveys, Virginia is often mentioned as one of the best states in which to retire. Bankrate, for example, has ranked it No. 5 on its list for two years in a row. In short order, the “old” in the Old Dominion may soon resonate in ways it never has before. A recent survey by the Transamerica Center for Retirement Studies, for example, found that 65 percent of baby boomers expect to work past age 65 or do not plan to retire at all. Many respondents indicated they plan to continue working because they believe they will need the income and health benefits offered by an employer. Other boomers, however, see opportunities for fulfilling careers beyond retirement age. Desiree White stopped working for years for family reasons. Then, in her 50s, she returned to the classroom with hopes of rejoining the workforce and drawing a paycheck. She enrolled at Blue Ridge Community College in Weyers Cave, earning “aging in place” certification to work with the elderly. She took courses in areas such as the principles of nutrition and human development and mental-health skills training. “It appealed to me, helping people grow old,” White says. Health care for the aging, in fact, is a rapidly growing occupational category. White is among the boomers who are stepping in to fill gaps in high-demand jobs. “At a time in life when a lot of people are thinking about retiring in 10 years, I believe I have a lot more to give than ever. It’s given me a brand new life,” White says. 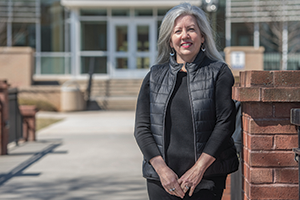 Robin Hawks, an associate professor of psychology and human services at Blue Ridge, says that 104 of the 3,600 students registered for the spring semester at the community college are 50 or older. Hawks says the baby boomers she sees in the classroom either want to re-enter the workforce as White did or to give themselves more opportunity to grow in their current jobs. For baby boomers who don’t want to retire, there are still opportunities for them at all levels, including the executive suite. “We’ve hired as many 60-plus-year-olds as 40-year-olds. If someone is qualified, they’re qualified,” says Hope Johnson, CEO of Pyramind LLC, an executive recruiting firm in Chantilly. Johnson says “economic necessity and boredom” are pushing a lot of retirees back into the workforce. 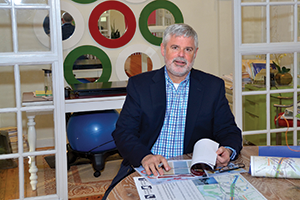 The financial environment facing baby boomers is far different from the one their parents encountered when they approached 65, says Matt Thornhill, the founder and president of The Boomer Project, a Richmond-based firm that tracks demographic trends. Boomers, he says, may live longer than their parents, but many will not have the financial resources that members of the “Greatest Generation” had. Based on the data he’s seen, Thornhill says that about a third of boomers, 25 million, will be able to live off their savings and retire comfortably. Of the baby boomers in the middle, perhaps the most critical third, Thornhill says some will make it and some will not. But he says those on the edge are running out of time to tilt the odds in their favor. Thornhill says one of the harsh realities facing boomers is that the ratio of young workers to retirees is shrinking dramatically. The Social Security Administration projects that the number of workers per beneficiary will fall from about 3 to 1 now to 2 to 1 by 2030. According to some projections, the Social Security Trust Fund will be fully exhausted by 2036. A recently completed study by the Wason Center for Public Policy at Christopher Newport University says that an increasing number of Virginians are entering retirement with insufficient means. One of the issues facing boomers, say Quentin Kidd, director of the Wason Center, and Jia Yu, a lecturer in the Department of Economics at Christopher Newport, is the decline in defined-benefit pension plans provided by employers. In their place, employees have become much more responsible for saving for their retirement through 401(k) plans and other options. One result, Kidd and Yu say, is that workers in their 60s are finding that they don’t have money they need to sustain themselves in retirement because they failed to save enough during their careers. “If people save less … what it means is that increasingly Virginia’s retirement population is going to be more dependent” on core government support programs, Kidd says. That situation, coupled with the surge in the numbers of retirees, could mean trouble for government officials. Fifteen percent of new retirees in Virginia during the next 15 years will each have a net worth of $201,000 or less, only about half of which will be easily accessible to pay expenses. For many Virginians, their primary source of net worth is their home. Through 2030, each of the least prepared retirees in Virginia will cost the state, local and federal governments an average of $22,500 annually in assistance. Through 2030, the total outlay of government-funded support is expected to top $4.7 billion and could reach as high as $5.1 billion. The top public assistance programs for low-income seniors are Medicaid, the Supplemental Nutrition Assistance Program and Low Income Home Energy Assistance Program. In addition, some localities offer additional assistance to qualifying seniors, in the form of lower real estate taxes and other discounts. A 10 percent increase in net worth among retirees could save taxpayers a total of $326 million through 2030 in reduced costs of government-funded benefits, according to the report. One of the most costly of these support programs is Medicaid, a government assistance program in which Virginia pays 50 percent toward health care for low-income individuals, and the federal government pays the other half. In March, Virginia Medicaid was covering more than a million people. The state had budgeted $9.3 billion for Medicaid in 2017-18, and ithe legislature approved $255 million more during this year’s session. The program grew by 4.5 percent from fiscal year 2014 to 2015 and 8.5 percent last fiscal year. In 2030, an estimated 155,300 new retirees will become eligible for Medicaid coverage with average costs of about $20,000 per person, or $3.1 billion. Baby boomers, who have defied convention at nearly every turn in their generational journey, might do it again when they decide where they want to live in retirement. A national survey of 1,000 persons by Better Homes and Gardens Real Estate found that 57 percent of boomers plan to leave their current homes when they retire. But nearly three-quarters of boomers, 72 percent, say they will retire in the state where they currently live. Just over a quarter, 27 percent, want to be in a traditional retirement community, such as a neighborhood for residents who are 55 or older. About 40 percent plan to retire in rural areas or small towns, while 26 percent want to live in an urban environment. The remaining 8 percent want to live in “lifestyle” communities, such as those planned around golf courses. Thornhill of The Boomer Project says boomers will live “everywhere” because they represent such a mammoth demographic group. Retirement communities, which have been building at a furious pace in some areas, will get their share. Even if a much lower percentage of boomers move into retirement communities than their parents did, “senior living will be full because there are so many of them,” Thornhill says. Glen Allen-based developer HHHunt Communities announced plans in late February for a 520-home community for people 55 and older in Goochland County. The project on 208 acres off Tuckahoe Creek Parkway near Capital One Financial Corp.’s West Creek campus includes a clubhouse, pool, walking trails and open green spaces. Jonathan Ridout, director of development for HHHunt, says while the new development is specifically focused on people in the 50-59 age group who are looking for a new home, anyone can live there. One trend, he says, is that midlife boomers are looking for “more open space and less formal space,” and they’re particularly interested in incorporating outdoor living into their lifestyle. “Another big trend is flexibility in the floor plans. This demographic might want a home office during the week that can be a bedroom on the weekend,” Ridout says. Among boomers looking for a new home to carry them through retirement, Ridout adds that more than a third are relocating fewer than seven miles from their current home. For those who don’t want to move into conventional senior living communities or other retirement facilities, there are other options. In Ashland, a group of about 30 residents is forming a nonprofit organization whose goal is to help people stay in their homes as they grow older. “Programs and services are provided through volunteer-based, neighbor-to-neighbor, pay-it-forward mutual support services,” according to a statement of the organization’s core principles. The services, which are still in the planning stages, would range from daily “check-in calls” on seniors to transportation to doctors’ appointments and help with routine home-maintenance chores, such as help changing hard-to-reach light bulbs. A different approach, a senior co-housing community called ElderSpirit, is taking place in Abingdon in Southwest Virginia. Co-housing communities are groups in which members of individual households share common space, often eat meals together and gather for socializing or religious observances. Dene Peterson, 87, a former nun and social worker who was a driving force in creating ElderSpirit, says the community has a waiting list of 30 people. “I’m amazed how thriving it is,” she says.